It is separated from corpus callosum by callosal sulcus. 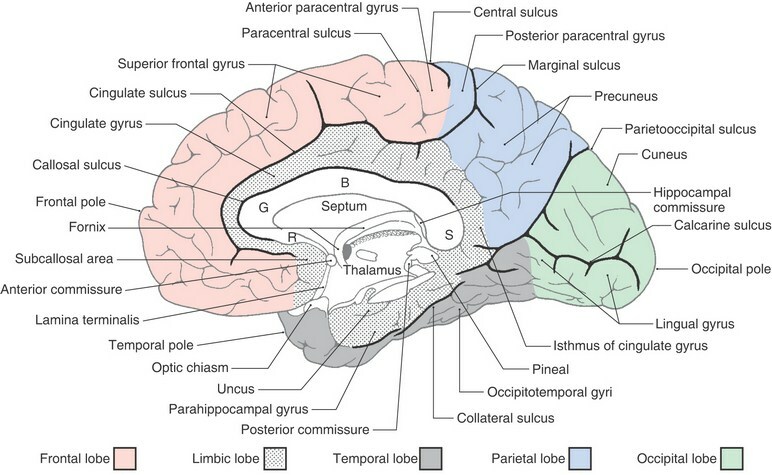 Cingulate gyrus is demarcated above by cingulate sulcus. This sulcus starts at its anteroinferior end below rostrum of corpus callosum. Its posterior end is upturned behind upper end of central sulcus. A small limb from it extends upwards towards superomedial border in front of central sulcus. Anterior end: It is very narrow end which is below rostrum of corpus callosum. It is called paraterminal gyrus. Posterior end: It curves round splenium of corpus callosum and ends at the posterior end of temporal lobe. It is called isthmus. Next group of gyri are studied from occipital pole to frontal pole. Lingual gyrus: It is a curved gyrus with convexity upwards like that of tongue, situated on lower part of medial surface of occipital pole. It is bounded above calcarine and postcalarine sulci. Precuneus: It is the quadrangular area in front of cuneus. It is bounded behind by parietooccipital sulcus and in front by posterior limb of curved upturned end of cingulate sulcus. Inferiorly it is demarcated from posterior end of cingulate gyrus by superosplenial sulcus which is a small curved sulcus posterosuperior to splenium of corpus callosum. Paracentral lobule: It is another quadrangular cortical area in front of precuneus. Behind: Posterior limb of posterior upturned end of cingulate sulcus. In front: Upturned anterior limb of cingulate sulcus. Below: Posterior end of cingulate sulcus. Above: Superomedial border of cerebral hemisphere. l Subdivision: Paracentral lobule is bisected by upward continuation of central sulcus on medial surface into anterior and posterior parts. These two parts are upward continuation of precentral gyrus and ostcentral gyrus respectively on medial surface. Medial frontal gyrus: It is the wide, flat and curved gyrus on medial surface of frontal lobe starting in front of paracentral lobule, curving over the frontal pole and ending below genu and in front of rostrum of corpus callosum.